We like the idea that fishing should be simple. We know about “one fly philosophy”. We also become real fans of kebari flies. The only thing we have to understand – the large variety of tenkara flies. Means every tenkara angler permanently moves to his own “one fly”. There is a large variety kebary, with each fly having different qualities. The obvious ones are the differences in shape, size and color, but they have other nuances as well. Mr. Yoshikazu Fujioka has done diligent research into tenkara flies, borne out of his own passion for the hobby. Thanks to his website"My Best Mountain Streams", we not only learn about tenkara flies, but also realize just how much there is to learn; the different flies are all influenced in their history and development by the geographical region, from which they come. Mr. Fujioka acts as our teacher into the study of tenkara, and he has helped us choose our own selection of tenkara flies. In the course of many years he has studied tenkara flies and gathered them from the various regions in Japan. The fruit of his research is his analysis of tenkara flies. Just like one might categorize Western flies into "dry", "wet", "nymph" and so on, Mr. Fujioka categorizes tenkara flies, focusing on the different styles and patterns used by tenkara practitioners. It is a great starting point for anybody wishing to delve into the differences of tenkara flies, though you can of course fish to your heart's content in the tenkara style without ever delving into anything. The tenkara flies known by most is the "sakasa kebari", also known as reverse hackle flies. 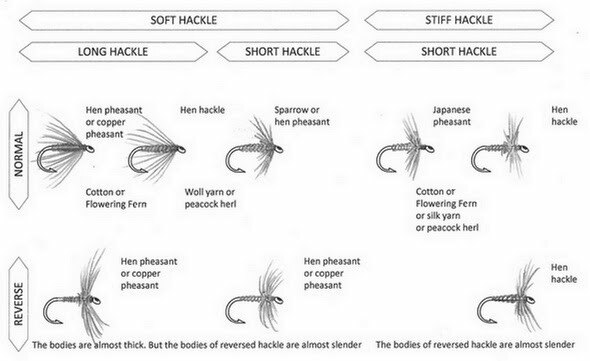 There are other kinds of flies in tenkara, however, as his graphic chart depicts. Even the sakasa kebari itself has many forms and shapes, each with unique qualities. The hackle may be more or less soft, more or less stiff, it may be short or long; the body may be thick or thin and so on. You will find after having experimented with various patterns that one is most to your liking; the fly that just suits you the best. There may be many reasons for why a fisherman prefers one fly over the other, but it tends to boil down to personal taste. Maybe you like your fly to be simple and easy to work with. Maybe you like that the hackle is soft, maybe you want to be stiff. Maybe you will find your own “one fly”. Read more about actual kebari patterns in Kebari Library blog.